Chilli Paneer is a very popular Indo-chineese mouth watering paneer delicacy. It can be served as appetizer or as a side dish for fried rice or noddles. Here I'm sharing a dry version of Chilli Paneer. I went to Forum value mall, Whitefield, Bangalore last weekend. 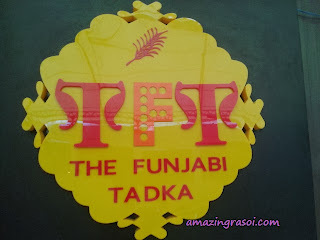 There I saw a new restaurant ' The Funjabi Tadka'. Never heard about that before. So thought of going there sometime. Very soon on a weekday(Thursday) I planned to go there and taste the north Indian dishes with my family. 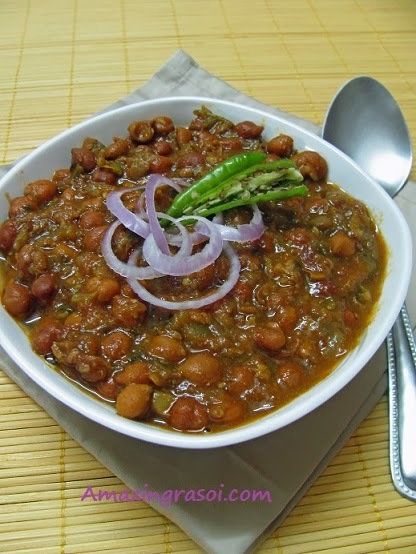 Black chana masala is another version of chole where we use black chana instead of kabuli chana. Black chana masala is my family's all time favorite. It goes well with rice and paratha. I have a very good memories associated with this black chana masala. When I was studying in college and staying in hostel, the mess of hostel use to serve horrible food. During weekend either we use to go out or cook in our room (which was not allowed). Most of the time I use to cook and the menu use to be black chana masala and rice with the minimal ingredients, so whenever I prepare this dish, it reminds me of my hostel life which I still cherish. On weekends we normally go out for Lunch/Dinner, just to have a change in daily routine and to have something different. And for a food blogger like me tasting different foods are always a learning experience. This weekend we couldn't go anywhere, so thought of ordering something from a nearby restaurant. I heard about foodpanda.in through one of my friend, so thought about ordering from there. These Smiley Cookies have chocolate flavor and simple vanilla flavor. My kid loved it.This recipe requires very few ingredients and easy to prepare. Both the flavor and crunchiness of cookies are awesome. Can prepare and store in air tight container for 1-2 weeks. After Checker board cookies,I wanted to bake cookies with a twist. 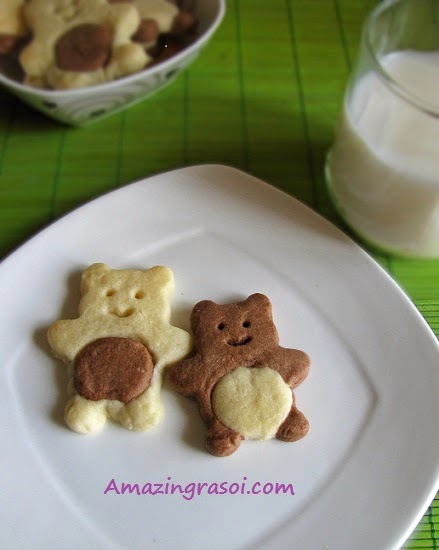 Last weekend I was sitting with my son who was reading some book and there was a picture of a teddy cookies, then suddenly he said mumma I want teddy cookies. Since I wanted to bake cookies so I said ok. In this recipe I have combined chocolate and vanilla taste together. 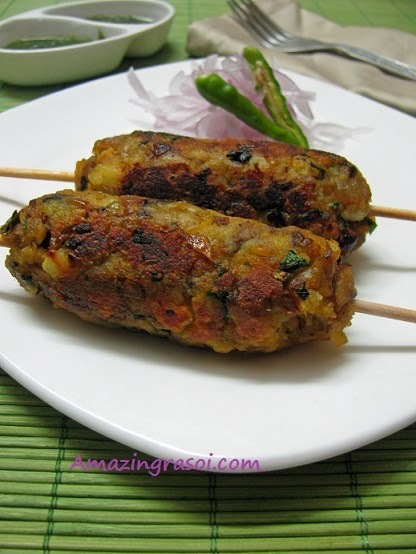 Kabab is the famous starter/appetizer, but for vegetarian the option is very limited. Few weeks back I prepared this kabab at home and it turn out good,but some how I forget to post the recipe. Yesterday when I was going through the post, I was quite surprise to see this recipe in draft. 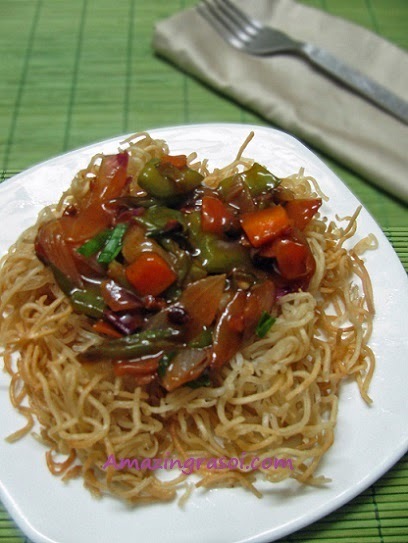 American Chopsuey is a Indo-Chinese dish where crispy fried noodles are served with Chinese style sauce. I like chopsuey a lot specially prepared by Avi as veg version of this dish is not very much popular. I simply love the way he prepares it. Last week when he was preparing, I asked him to take the pics of steps so that I can post this recipe. I'm sure everyone must have tasted matar paneer as main course gravy but you must have not tasted in form of biryani !! Yes you read it right...in form of biryani...Matar Paneer Biryani !! 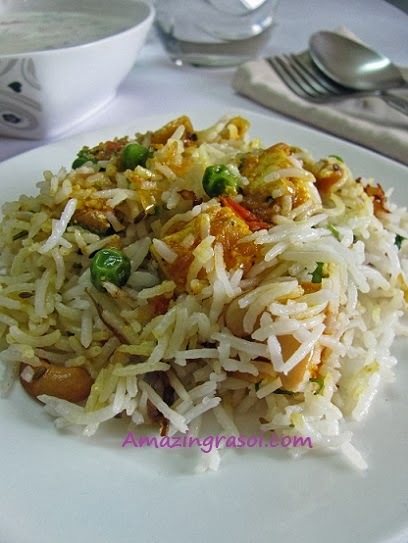 !Matar Paneer Biryani is tasty twist to the authentic Biryani.